I have uploaded the Colonial version of my PORTABLE WARGAME rules (in PDF format) to THE PORTABLE WARGAME website so that any interested blog reader can download them and possibly use them. This draft uses the same basic game mechanisms as the earlier 'Musket' version of the rules, but I have added some extra weapon types (e.g. Magazine Rifles, Machine Guns) as well as including an option for Native Infantry and Cavalry Units to make double-length moves if their Commander achieves the right score on a D6 die. The rules are still very much a 'work in progress', and may be subject to change as and when they are play-tested ... which will hopefully be quite soon. Colonial Wargaming website: Updated ... at long last! After over a year of inactivity I have finally managed to update my Colonial Wargaming website. Most of the updates are to the Books pages of the Inspiration section of the website, but over the coming months I hope expand various sections and to extend the scope of the website to include some of the non-colonial conflicts that took place between 1850 and 1920. I have added details of my most recent acquisition – WARSHIP 2010 – to the Books pages of the Inspiration section of my Colonial Wargaming website. I realised this morning that the version of Joseph Morschauser's 'Frontier' wargames rules that I had made available as a download in PDF format from the Colonial Wargame Rules section of my Colonial Wargaming website contain several errors. I have now corrected them and the new version of the rules can now be downloaded. Further to my last two blog entries, I have now re-written Joseph Morschauser's 'Frontier' wargames rules in the hope that modern wargamers will find them clearer and easier to understand. They can now be downloaded in PDF format from the Colonial Wargame Rules section of my Colonial Wargaming website. Like all the other rules available in that section, they are not password protected. Its quiet out there ... too quiet ... or is it? The following images of what I think are the 'Frontier' rules in use on the tabletop are from Joseph Morschauser's HOW TO PLAY WAR GAMES IN MINIATURE and Donald Featherstone's ADVANCED WAR GAMES. Despite several people asking if I have given up on Colonial wargaming, the truth is that for the last few months my attention has been elsewhere. I have continue to develop my version of Joseph Morschauser's wargame rules, and have helped set up a blog that deals with the interwar era (from 1919 to 1939, give or take a few years). One byproduct of my work on Morschauser's rules is that I now have a copy of his 'Frontier' rules. These are the ones that I think he used in the games that are featured in the famous photographs in Donald Featherstone's ADVANCED WAR GAMES. I intend to demonstrate these rules at the next COW (Conference of Wargamers) in July, and this will entail doing some work on the layout of the rules as their current format is a little dated. A second byproduct is that I have begun to realise that there were a considerable number of Colonial conflicts during the interwar era, and that this is a fertile area for my Colonial wargaming in the future. So things have bee quite out there for a few weeks ... but not too quiet! I have added details of my recent acquisitions to the Books and Videos and DVDs pages of the Inspiration section of my Colonial Wargaming website. Since my last blog entry I have acquired a couple of items that might be of interest to the colonial wargamer. 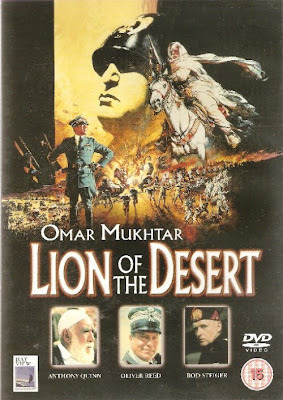 The first is a DVD entitled OMAR MUKHTAR: LION OF THE DESERT. This film is set in the late 1920s, and tells the story of the Italian attempts to crush the remnants of Libyan resistance to Italian colonial rule. This resistance was led by Omar Mukhtar who proved to be a very able leader of irregular forces. The films stars Anthony Quinn as Omar Mukhtar, Oliver Reed as General Rodolfo Graziani, and Rod Steiger as Mussolini, and features a large number of recreated and restored vehicles, including some Fiat tanks. I managed to see this film when it first came out in 1981, but only recently discovered that it had been released as a DVD. When I saw a copy on sale at a recent wargames show, I had to buy it! My other recent purchase is a copy of the Osprey book about the OTTOMAN INFANTRYMAN 1914-18. The book's author is David Nicolle, who is well known writer on medieval and Islamic warfare, and the illustrator is Christa Hook. 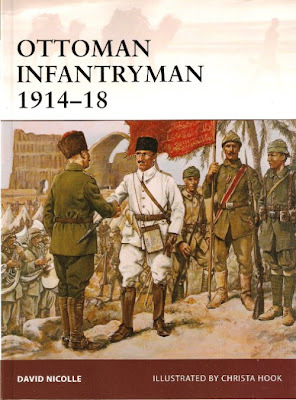 The book as a short Introduction, a Chronology of the main events affecting the Ottoman Empire from 1914 to 1918, a Bibliography, and a very useful Glossary of Turkish military terms.